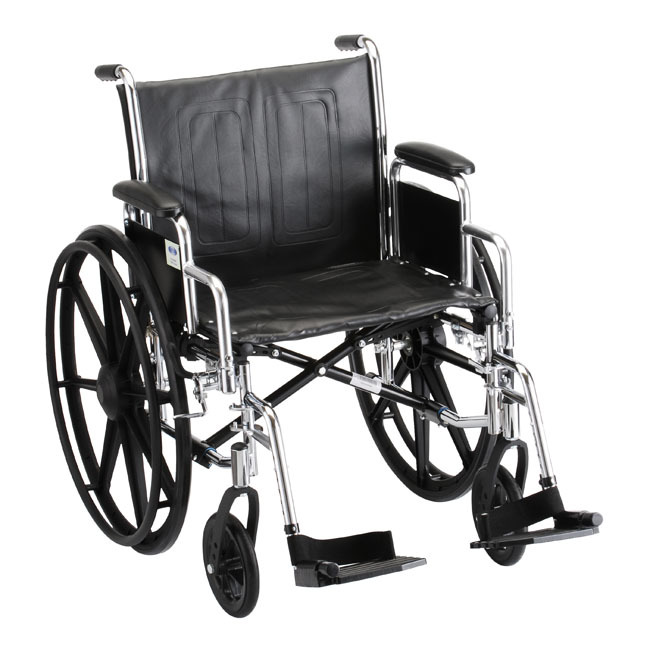 The Nova Heavy Duty Steel Wheelchair is available in 20", 22" and 24" seat widths. It comes equipped with detachable and reversible desk arms and swing-away footrests, elevating legrests are available as an upgrade. The Nova Heavy Duty Steel Wheelchair is available in 20", 22" and 24" seat widths. It comes equipped with detachable and reversible desk arms and swing-away footrests, elevating legrests are available as an upgrade. It also features dual axle positions for quick seat height conversion and flame retardant black nylon upholstery. Weight Capacity: 325 lbs. - 20" / 350 lbs. - 22" / 425 lbs. - 24"
Seat Width: 20" - 24"
Overall Width (Add to Seat Width): 9"
Folded Width: 12in - 20" / 13.5in - 22, 24"